I completed my Bachelor of Science degree in zoology and ichthyology as well as my honours in marine biology at Rhodes University. The ocean has always been a special place to me, searching through rock pools and with an eye kept on the horizon for whales I spent many hours getting sand between my toes and salt in my hair. Recently I began my masters, through Rhodes University, and my passion for marine work has brought me to the Keurbooms Estuary. An estuary is rather difficult to define in one term but simply they are the meeting place of rivers and seas and they serve a number of crucial ecological roles. Many fish and invertebrate species depend on estuaries and use them as nursery grounds and refugia. The Keurbooms Estuary has a permanently open mouth and is tide-dominated. It is ranked in the top 20 most important estuaries, in terms of conservation, of South Africa. What makes Keurbooms so special? Well, a large portion of the system is made up of beds of Eelgrass (Zostera capensis) this seagrass is vital for many species, making it a very productive area. Not only do estuaries provide sometimes temporary habitats for species during part of their life stage but in fact, there are a host of species which can only be found in an estuarine environment, such as the Knysna seahorse (Hippocampus capensis). Keurbooms Estuary is one of three estuaries that provide this endangered seahorse with a home. If you have ever been fortunate enough to spend some time in Keurbooms you will know the estuary has a host of interesting residents. The banks of the Keurbooms estuary are susceptible to flooding events thus increasing the risk of erosion. A means of combating this is the implementation of artificial structures called Reno-mattress which are flattened wired boxes filled with rocks. Along most of the eastern bank of the estuary, these Reno-mattress structures are prominent and with the new installation of more, it gives an opportunity to study their ecological effectiveness. So as you are enjoying your morning coffee or a paddle down the water you may notice a wet-suited individual braving the water and carrying an odd assortment of equipment. Armed with miniature baited remote underwater videos (BRUVs) and a sediment corer I began my study on a windy and wet July morning. My study is focused on comparatively looking at the different assemblages of fish and invertebrate (bug) species found in three habitats. The natural habitat is the beautiful underwater fields of eelgrass beds which act as an important nursery area for a number of species. The other two habitats are Reno-mattress sites, one older than 5 years and the other has just been installed earlier this year. To sample the invertebrates (any animal without a backbone including crabs, shrimps, worms, and snails) sediment samples are taken and the contents sifted through, the animals are then identified and counted. The real excitement comes from a relatively new method of sampling the presence of fish species. A Go-pro underwater camera is mounted onto a frame with a pouch for bait and deployed for one hour. As soon as the cameras are placed in the water a number of curious marine, and estuarine animals come to investigate the alien structure. This kind of non-destructive sampling allows for cryptic species to be caught on camera and can be a fantastic tool in future studies of the area. Not only am I lucky enough to have a beautiful place to call my office, but fishes aren’t the only thing that have been inquisitive enough to come see what I’m doing. A sneaky furry resident has often popped up next to me, probably mistaking me for a fellow seal, and has tried to coax me into surrendering some bait. I have just finished the first part of my study and have already noticed that more fishes can be seen on the Reno-mattress especially those that enjoy hiding in its crevices. During the summer sampling many more species were seen, this is expected as juveniles grow and feed in estuaries. Many important line fishing species have popped up on the cameras such as Spotted Grunter, Leervis and Blacktail this is excellent to see as it indicates the importance of this system. As for the bugs and critters most prefer the soft muddy sediment of the eelgrass meadows. Now that the new artificial structure is in place my next task is to see what decided to call it home. 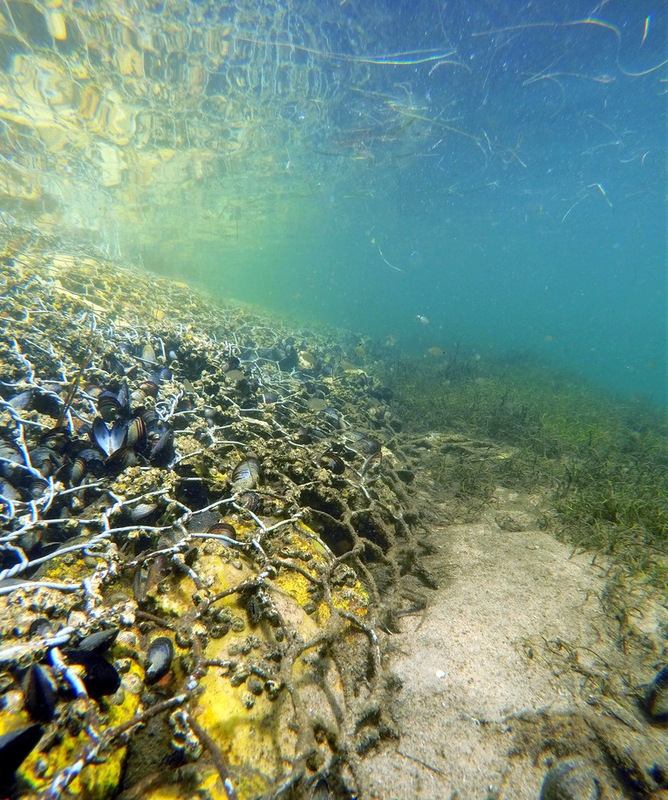 Along the older section of Reno-mattress barnacles, mussels and the occasional oyster have been found to dominate the intertidal world of wire and rocks which probably means fairly soon they will start popping up along the new section. In no way can we expect human encroachment to slow down but what we can do is assess changes and see how this can give insight into the changes that face South Africa’s truly exquisite estuarine systems.